Purchase Activated Manufacturing factories make a net profit after only 300 apparel units a day...Each line can produce up to 3000 a day. Learn how it works and build your own. Watch the videos linked below and follow this blog. Moving from a traditional supply chain model to an on-demand workflow is not as easy as flicking a switch. But AM4U CEO Bill Grier believes there is a place in the supply chain for microfactories to make this transition easier. Tansy Fall reports. Among the biggest challenges facing apparel manufacturers today is shortening time-to-market whilst simultaneously reducing inventory. This issue has risen to prominence thanks to both ecommerce and the changing demands of consumers, which has left the traditional textile and apparel supply chain in a quandary over how to keep up with demand. On-demand manufacturing has the potential to solve both inventory and time-to-market issues. However, the lack of data sharing in the industry is seen to be stifling brands’ and retailers’ ability to connect orders with production. If businesses could better connect to the rest of the supply chain, brands and retailers would undoubtedly see dramatic improvements in sell-through (the percentage of a product that is sold by a retailer after being shipped by its supplier) and ultimately in-store and online profits. This is where US-based AM4U (Apparel Made For You) comes in. The company is aiming to position itself as a leading consultant and supplier of microfactories and CEO Bill Grier is confident that there is a way to change the make-up of the supply chain, though admits it will be a gradual process. Grier has long worked in the digital printing space but has also been employed as a technical adviser to American apparel businesses. In 2012, Grier launched AM4U with the goal of demonstrating the capabilities of a demand-based integrated microfactory, for deployment in the apparel sector. The company has since struggled to on-board the concept with brands and retailers and Grier says this is largely due to the mindset of the industry and its historic structure. “We are still mired in the industrial revolution,” he explains. 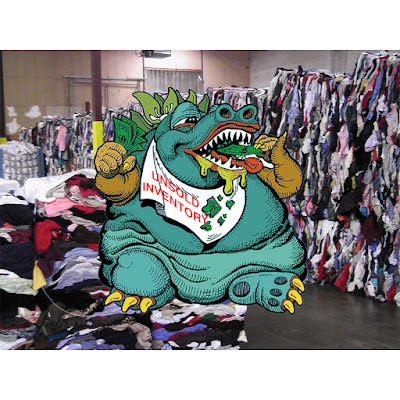 “The mentality of investment, the mentality of purchase, and the mentality of stocking and inventory. We build factories for capacity […] and capacity is the antithesis of demand. […] The brands were not ready. Everyone visited us but nobody bought because they had no deployment plan. Most recently, the difficulties associated with working in an industry very much set in its ways has led AM4U to partner with event organisers UBM Fashion, to build three integrated microfactories on the show floor of Sourcing at Magic, which took place in February 2019. The company is endeavouring to showcase the customisation possibilities of a digital microfactory and encourage those in sourcing departments to think outside the box. Away from the exhibition floor, Grier says he has also spent millions of dollars trying to develop a new way of making apparel, with each on-demand factory requiring an average investment of US$650,000 for set-up. From this, he has learnt that there are two key elements for success, which are now driving his business forward: integration across the supply chain and deployment planning. The role of the merchandiser at a brand or retailer is to predict up-and-coming sales trends, and therefore to ensure maximum profitability. Merchandisers make certain that products appear in the right store, or online, at the appropriate time and in the correct quantities. Moreover, the merchandiser directly liaises with the distribution centre and often has access to data from the POS and the supply chain. This enables them to identify production and supply difficulties and deal with any problems or delays as they arise. As a result of this, the merchandiser is also well placed to make decisions about product quantities, however they are often bound by pre-ordered stock and are therefore also responsible for monitoring slow sellers and therefore price reductions. Moving inventory along the supply chain is not a solution. However, adding microfactories to distribution centres, well placed to leverage POS data, could be the appropriate first step towards digitalisation of the industry. This is particularly applicable for high-risk products such as prints. White or black garments still lend themselves to being manufactured in bulk, responsibility for which remains with the buyer. But for those products that are more experimental, be that in colour or design, on-demand production can allow for garments to be bought before they are made; limiting the risk the brand or retailer takes in producing them. If they are successful, manufacturing capacity can then be increased. This assessment highlights the validity of the microfactory concept, provided retailers and brands can be moved towards an on-demand sourcing structure. “We began to realise that the biggest issue was that nobody was ready to give us [the manufacturer] POS data. […] The manufacturers can’t change until the point where the money enters the system changes.” Therefore, the microfactory needs to be close to the end consumer, where the money enters the value chain. One AM4U customer based in Los Angeles, US, has embraced this microfactory concept and has successfully set up partnerships with brands. The business is a leggings manufacturer, and the owner is able to pay its workers US$20/hr, Grier says, selling a pair of leggings for US$32. Grier explains that the business has ‘silhouette discipline’ meaning that the design of the leggings can be varied and easily changed whilst the tried and tested shape of the leggings remains the same. In the creation of microfactories, two areas of the supply chain that have been very separate for the majority of the industry’s history are united: “Colouration has been separated from cutting and sewing for so long that they don’t have an understanding of it,” Grier comments. Technology also clearly needs to advance to achieve the seamless production processes that the implementation of microfactories require to be successful. With the concept of microfactories at the distribution centre, responsibility for investment could finally be brought to the table of those that hold the most capital for investment, the brands. Principle 1: "Follow the Money"
Bill Grier is a pioneer in the digital print industry. As the inventor of numerous international and U.S. patents, As an originator of the AM4U project, Bill is the inventor of and chief scientist responsible for perfecting Active Tunnel Coloration (ATC) infusion technology. Link: https://www.youtube.com/watch?v=2Xv67p9dkSE&t=11s Bill’s early years were spent learning the complexities of leadership first as a young manager at General Foods in White Plains, NY and later as a member of the White House Staff. Bill then returned to college and upon graduation joined the United States Marine He had a 37-¬‐year military career of active and reserve duty holding 12 Commands retiring as a decorated US Marine Corps Colonel. Bill was then recruited by CACTUS Inc. one of the earliest large format RIP producers. While Chief Operating Officer at CACTUS, Bill studied the physics of polymer crystallization, which lead to numerous discoveries and patents in the coloring of polyester fabrics.